Breast cancers are still among the most pervasive and deadly cancer types known to humanity. Despite all the research done to combat them, they remain a prominent cause of death, especially among women in Western countries. These cancers may gain success because of their ability to incorporate other cell types from the body. Once they become a part of a tumor, these cells are exploited to enhance the growth and success of the mass in question. 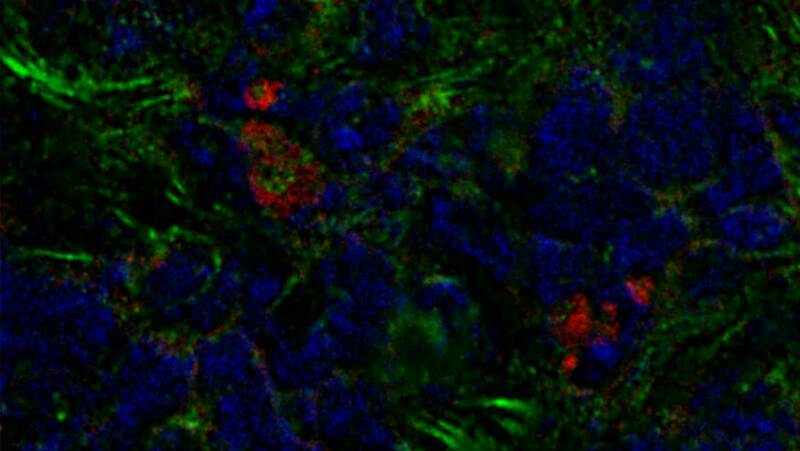 A new article in the Journal of Experimental Medicine describes a recently-discovered subtype of these cells. It appears that their inclusion in a tumor could be associated with decreased chances of survival in cases of breast cancer. Therefore, specifically targeting this cell type may have a positive effect on the mortality of patients. The cell type in question is a type of fibroblast, a stromal cell that normally plays a role in healing, immune functions, and the connective tissue. But, these cells, in or near a tumor, and their effects, can be negated. Cancer-associated fibroblasts (CAFs), as they are being called, are turned to uses such as the production of dangerous inflammation, the promotion of cancer cell proliferation and angiogenesis (a process by which tumors develop their own mini-blood vessels to leach more nutrients and oxygen from the rest of the body). These functions have positive influences on tumor progression. CAFs are known to be strongly associated with breast cancer and help these tumors to grow and thrive to the point where they can invade other tissues and evade treatment strategies. Furthermore, CAFs may be capable of altering the tumor’s extracellular matrix (ECM) makeup. These cellular ‘external layers’ are made of proteins such as collagen and afford a form of protection and host-recognition to many cell types. In the case of a breast cancer tumor, an ECM with dense, cross-linked collagen has been found to be conducive to progression. CAFs are thought to become linked to tumors from the surrounding healthy breast tissue. However, they can also be recruited to tumors from more distal, alternative sources such as muscle tissue or fat tissue. A group of researchers from the Sackler School of Medicine in Tel Aviv has reported the identification of a different source of CAF: the bone marrow. These cells differentiate into fibroblasts from progenitor cells called mesenchymal stromal cells (MSCs). Breast cancer tumors appear to have a preference for MSCs as they have a marked deficiency in the cell-surface protein platelet-derived growth factor α (PDGFRα). These cells, once integrated into a tumor, may also mediate a reduced ratio of PDGFRα+ fibroblasts to PDGFRα- fibroblasts. This, again, has been shown to be beneficial to tumor tissue in earlier studies. The Sackler team conducted a comparative analysis of breast cancer tissue and normal, corresponding tissues. They found that 45% of the CAFs in the tumor tissue expressed PDGFRα, whereas the fibroblasts in the normal tissue were 80% PDGFRα+. Further investigation found that, while the actual numbers of PDGFRα+ cells in tumor tissue remained consistent over time, the PDGFRα- cells divided in order to outnumber them over the same period. 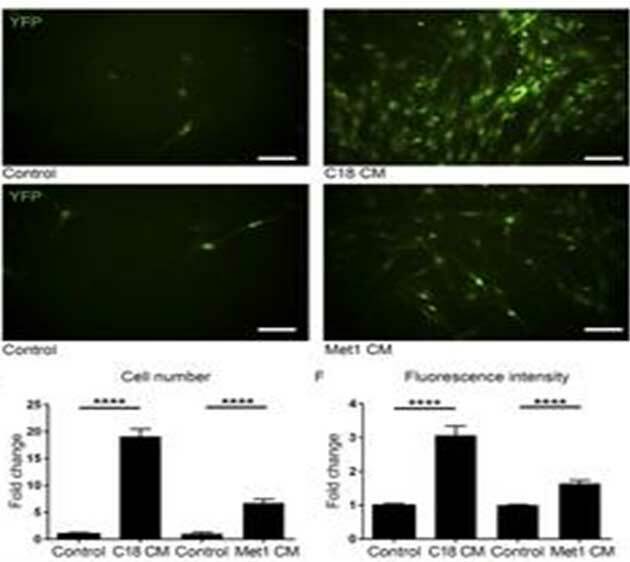 The team also confirmed that the transplantation of bone-marrow-derived fibroblasts was present in murine breast and lung tumors through fluorescent imaging studies. This was done by linking a ‘red’ fluorescing tag to PDGFRα and a green one to CAFs expressing different cell-surface markers (e.g., SMAα). The researchers also used these imaging techniques to show that PDGFRα- CAFs migrated from transplantation sites into breast tumors. In addition, the researchers demonstrated that these CAFs originated in the bone marrow and did not differentiate into abnormal fibroblasts until they were in the tumor microenvironment. Does PDGFRα have a Future in Breast Cancer Treatment? The researchers also analyzed data from the Human Cancer Genome Atlas (HCGA) and found that PDGFRα was significantly reduced in cases of breast cancer, and inversely associated with better outcomes in this database. Therefore, these PDGFRα- CAFs may be a viable new target in the treatment of breast cancer. On the other hand, these results were based on a single animal trial. However, any work that improves the understanding of this particularly deadly cancer can only be an asset to the medicine of the future.